A Master’s degree candidate in violin performance at the Juilliard School and student of Masao Kawasaki, Sarah Marin Moench is also a frequent chamber player in venues around New York City. 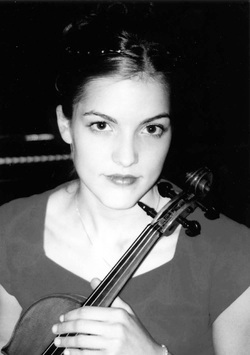 Her preparatory path began in Salt Lake City with Gerald Elias, Associate Concertmaster of the Utah Symphony, wound through San Francisco for private studies with Camilla Wicks of the San Francisco Conservatory, then through the Cleveland Institute of Music where her Bachelor of Music degree was awarded after studies with Linda Cerone and Cleveland Orchestra Concertmaster, William Preucil. Ms. Moench has been instructed in quartet master classes with the Emerson Quartet, Takacs Quartet, and Donald Weilerstein. She was a member of the Cleveland Institute Intensive Quartet Seminar for two years, working closely with the Cavani Quartet and former Cleveland Quartet member, Peter Salaff. She spent last summer amidst the mountains and music at Aspen as a festival player, and was invited the previous summer to play with England’s Britten-Pears Festival Orchestra. Ms. Moench began her violin career at age three with the late Hiroko Primrose. Successful in the Utah Symphony Youth Guild, Utah State Fair, and American String Teachers Association competitions on eight occasions, she has soloed with the Utah Symphony on four programs. Other solo appearances have been with the Encore School for Strings in Hudson, Ohio, where she has participated in five summer festivals, and the Temple Square Concert Series in Salt Lake City, where Eugene Watanabe has recently been her coach. An award-winning piano student as well, before directing her interest exclusively toward the violin, Ms. Moench comes from a musical family. Her violinist sister and cellist brother are conservatory graduates. Her violin-teacher mother has sent a number of young students on to budding professional careers in music performance.